It’s been a very, very eventful year. And 2016 may well be even busier. Before I sign off for 2015, a few wishes for the new year. America doubles down on tolerance, understanding, and compassion. And rejects ideas, policies, plans, and laws based on ignorance, racism, and a desperate attempt to marginalize anyone who doesn’t look or worship the way “we” do. Here’s hoping you and yours get to enjoy the last week of the year – and it is happy and merry indeed! Yesterday we focused on enrollment, and more specifically the change in the number and percentage of eligible Americans covered by health insurance. In sum, about 9 million more non-elderly folks were insured earlier this year than were at the end of 2013; that means a decrease in the percentage of non-elderlies without insurance from 16.2% of the population to 10.7%. Today we’ll look at health care costs. 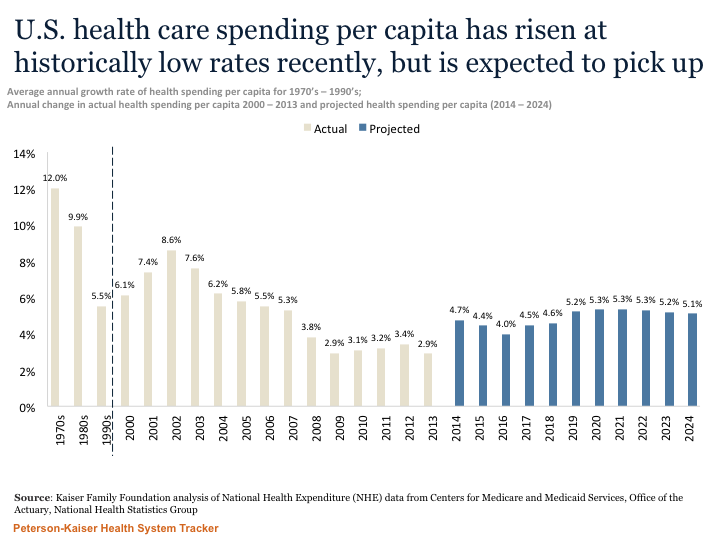 One of the ACA’s goals was to reduce future medical costs; to be clear that does NOT mean costs in 2016 will be less than costs today, but rather cost inflation will be lower. A bit of history is helpful here. I sold health insurance to employers a long time ago; when I could deliver a rate increase below 20%, I felt pretty good. Nowadays, rates are going up in the low teens for most individual coverage – but that’s just part of the picture. Let’s start with total health care costs – because we taxpayers fund Medicare and Medicaid as well as our own coverage. Now, on to employer and individual costs. Let’s understand that ACA does have SOME impact on costs; added benefits, Exchange distribution, mandated coverage, and the demise of many Co-Ops thanks to the “Rubio Amendment” are repercussions that have yet to be fully felt. For employers, the latest reports indicate increases of 6.6% (HMO plans) to 9.9% for PPOs for 2016. The primary drivers are prescription drug and hospital pricing; both are up substantially. Notably, Segal’s trend increase predictions have consistently been a couple points higher than the final results. Finally, I’d note that shopping on the Exchanges can be quite beneficial. We switched from an Excellus Blues Gold plan to a Fidelis Platinum and cut our premiums by $50 a month and out of pocket expenses by several thousand dollars. Better coverage, way better health plan (Excellus screwed up our enrollment, billing, and coverage repeatedly), and less money. ACA looks to be moderating long-term trend rates overall. Total costs for 2015 are well under prediction and forecasts look good. That said, there are pockets of big increases – some of that due to the lack of competition. All in, there’s about 6.5 – 7 million new non-elderly insureds via public and private exchanges to date. The total increase in non-elderly insureds from 2013 to 2014 was just under 9 million (this includes employer-sponsored insurance and governmental programs). While there’s no completely precise way to get to an accurate number of exchange enrollees, by far the best source for most info is Charles Gaba. According to the latest estimates, between 32 and 36 million remain uninsured. (the definition used for the latter figure is “at the time of the interview”; as definitions vary, one has to be careful when comparing reports). In Medicaid expansion states, the percentage of those uninsured decreased from 18.4% in 2013 to 13.3% in 2014. 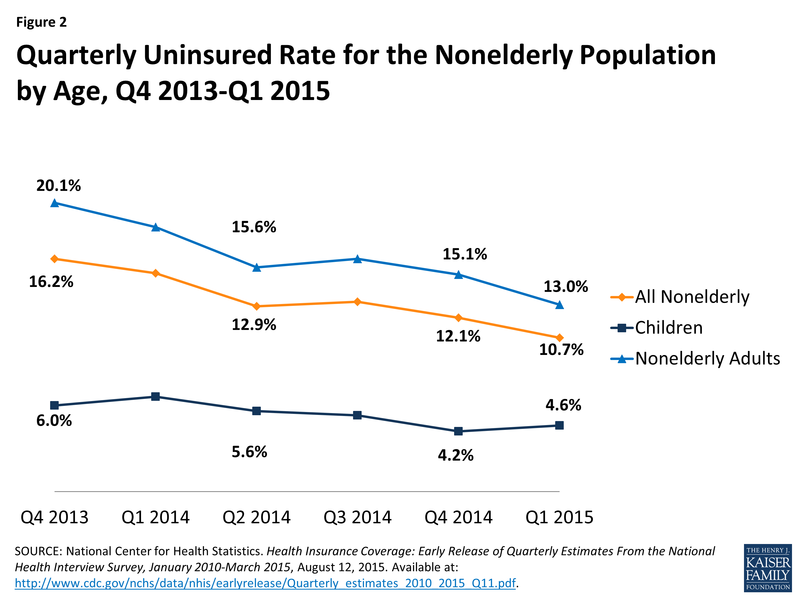 In non-expansion states, the percentage uninsured decreased from 22.7% in 2013 to 19.6% in 2014. About 21% of the 36 million are either undocumented or legal immigrants who’ve been in the US less than 5 years; this population is not eligible for governmental programs or subsidies. No, ACA has not “overstepped its bounds”. The efforts by states are just that – state-based – and they are allowed/enabled by Federal legislation that is separate and distinct from the ACA. Michael Stack has written an excellent summary of the situation, noting that the federal legislation allowing Medicaid to pursue settlements was part of the Medicaid Secondary Payer Act, which in turn was part of the 2013 Budget Bill.. In fact, I find the attempt to link ACA with state Medicaid recovery activity curious and convoluted. ACA expanded Medicaid – in states agreeing to do so. States remain the primary regulatory bodies for Medicaid. There is nothing in Ms Reaston’s argument that indicates how or by what means ACA encourages Medicaid to pursue workers comp settlements. States that expand or don’t expand Medicaid can decide to pursue settlements – independent of ACA. Make no mistake, there are clear “winners” here – taxpayers. Any taxpayer should demand Medicaid recover any monies necessary to provide treatment paid for by Medicaid that should have been covered by workers comp. Hosted by Workers’ Compensation Insider, and stuffed full of the latest and greatest on challenges to the ACA, new news on provider reimbursement, and Roy Poses’ ongoing effort to expose the sleazy side of health care and medical research. Last week’s webinar on ACA and the possibility of case-shifting due to capitation was quite well attended – those who could not make it can take a listen by signing up here (there’s a fee for members and non-members of WCRI). I was honored to be asked to participate, asked to present a different perspective (namely, it’s very hard to attribute case-shifting to ACA) based on what I see as a very complex and diverse health care world. Here are a few reasons for my skepticism. About 2/3 of HMOs use capitation to reimburse provider groups. About 60% use some form of fee for service, so many HMOs use BOTH capitation AND FFS. Almost all PCPs are NOT paid by capitation. In fact, PCPs are most often paid by FFS. Some – but by no means all – ACOs contract with employers. Capitated reimbursement is almost unheard of in these arrangements. The interaction of reimbursement and physician behavior is complex and by no means straight forward. So, while the provider group is frequently capitated, the providers within that group are not. There’s also no indication that capitation at the group level is becoming more popular under ACA. When you think you are starting to figure things out, it’s probably because you just haven’t looked deeply enough. Health insurance is a classic mature industry; consolidating, dominated by a few very large players, very difficult to enter, price-driven. they have terabytes of data on everything from provider practice patterns to consumer spending habits to drug dispensing, allowing them to predict costs, trends, and expenses with far more accuracy. Co-Ops, those not-for-profit, consumer-driven, local health insurance outfits were going to challenge the big boys, relying on great service, intense marketing, and local knowledge to carve out a niche in local markets. And the ACA had provisions specifically designed to help them develop, grow, and become viable competitors – in local markets – in an industry dominated by behemoths. These provisions included “risk corridors”; financial vehicles designed to help health insurers entering markets by offsetting initial losses by transferring profits from their wealthier competitors. The idea was to force competition into a market where size is all that matters, where it is all but impossible for new, entrepreneurial competitors to start, much less succeed. Lest anyone think this was a new thing, recall a similar program was implemented by George W Bush and his GOP allies in the Medicare Part D program. Here’s the net. A politician scores political points by killing a program his own party used to pass the biggest entitlement increase in 50 years. And in so doing, he killed off competition in the industry that needs it more than any other. Less competition will lead to higher prices and poorer service. 2015 Work Comp predictions – how’d I do? Each year I publicly prognosticate about the year to come – and, being one committed to personal responsibility, I report back 12 months later. Here’s how prescient I was this time around. 1. Aetna will NOT be able to sell the Coventry work comp services division. 2. Work comp premiums will grow nicely. Correct – employment and payroll is up. That plus higher rates in CA delivered a BIG year. 3. Additional research will be published showing just how costly, ill-advised, and expensive physician dispensing of drugs to workers’ comp patients is. 4. Expect more mergers and acquisitions; there will be several $250 million+ transactions in the work comp services space, with more deals won by private equity firms. 5. A bill renewing TRIA will be passed; the new GOP majorities want to show they can “govern” and this has bipartisan support. 6. Liberty Mutual will continue to de-emphasize workers’ comp. 7. After a pretty busy 2014, regulators will be even more active on the medical management front. Work comp regulators in several more states will adopt drug formularies and/or allow payers/PBMs to more tightly restrict the use of Scheduled drugs via evidence-based medical (EBM) guidelines and utilization review. Expect more restrictions on physician dispensing and compounding, increased adoption of medical guidelines and UR, along with incremental changes in several key states (California we hope) to “fix” past reform efforts. Partially Correct – formularies have been a very hot topic and regulations tightening up compound dispensing and pricing are in place in several states. California’s a bit less of a concern following the Stevens ruling affirming the constitutionality of the UR/IMR process. But there’s been little progress re physician dispensing and not much on UR and EBM. 8. There will be at least two new work comp medical management companies with significant mindshare by the end of 2015. These firms, pretty much unknown today, are going to be broadly known amongst decision-makers within the year. While they will not generate much revenue this year, they will be attracting a lot of attention. Wrong. The companies I’ve been following aren’t quite there yet. 9. Outcomes-based networks will continue to produce much heat and little real activity. 10. Medical marijuana will be a non-event. Amidst all the discussion of medical marijuana among workers’ comp professionals, there’s very few (as in no) documented instances of prescribing/dispensing of marijuana for comp claimants. Yes, there will likely be a few breathless reports about specific claims, but just a few. And yes, there may also be a few instances of individuals under the influence of medical marijuana incurring work comp claims, but these will be few indeed. Not sure. Not that I’m waffling here, but activity has been limited to a couple of states, with New Mexico the most prominent. Much as we respect the Land of Enchantment, NM’s relatively small population and still-unusual legalization of Marijuana does not make its situation a major deal. Buried in a project and travel this week, so missed a few things worthy of note. From PwC, a new report on the evolution of primary care. Key takeaways – The “consumer” of primary care is changing to more elderly and more Hispanic buyers; who delivers primary care is changing as big retail outfits get involved, and reimbursement is getting better too. 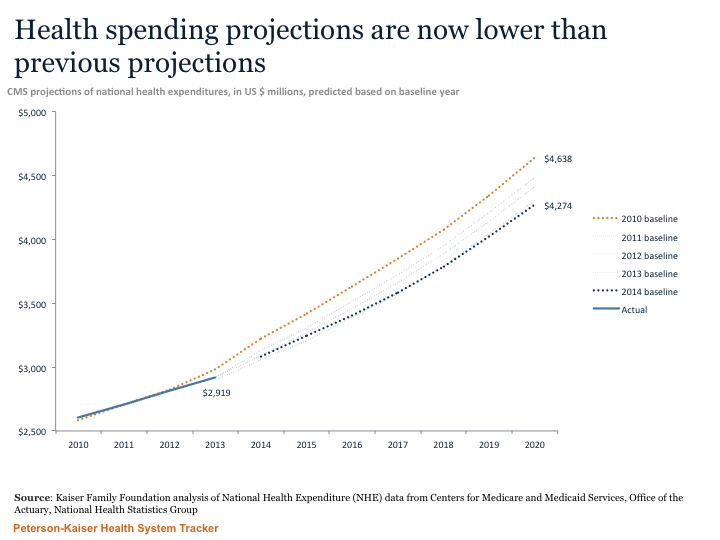 A thoughtful piece from Health Affairs unpacking the recent news of health care spending growth. Important note – remember this is OVERALL growth, not per-insured. As insurance covers more Americans, it isn’t surprising that health care costs increase as well. WCRI is out with a revealing studies about California post-reform. The California study indicates early results show medical costs are down about 5 percent since 2012’s reform implementation. There’s a related study just out from CWCI – an exhaustive analysis of the UR/IMR process and results therefrom. Key takeaway – the estimated approval rate for all California workers’ comp medical services ranges between 95.7% and 96.1%. Had a very interesting evening talking with a couple dozen Wall Street folks about workers’ comp earlier this week. Interesting because a) it’s still surprising to me that anyone in the investment community really focuses on work comp; b) most were pretty knowledgeable about the space; and c) I learned a lot about the “secondary debt market” for privately held company debt. systematic reviews and meta-analyses which encompass all of the studies both published and unpublished on a particular [medical] question, studies that have been analyzed and statistically combined to create a summary of what is reliably reliable. Think of the body of medical procedures, screening programs, and drug treatments as a pie. If you were to divide that pie into thirds, the first third would contain all of those procedures or treatments that we know are underpinned by quality medical research and for which we can truly say with some degree of certainty that they “work.” The second piece of pie would contain those things we routinely do but we don’t have strong evidence that the benefits exceed the harms, because they haven’t been well studied. The last third would contain many things that we do in medicine and health care where there is evidence that they do more harm than good, and we should stop doing those things. An interesting piece from Harvard Business Review on “why no one is reading your white paper.” I’d suggest it’s also because no one cares – that is, your white paper has to speak to a specific problem that person has. If it doesn’t, it may be interesting but it won’t be effective. Effective defined as inspiring that person to do something. United Healthcare and the Exchanges; what’s the real story? There’s been a lot of focus on United Healthcare’s announcement that its Exchange business is not doing well – and is likely to lose somewhere around $200 million this year. CEO Stephen Hemsley said their mistake was getting into the Exchanges too soon, before things had a chance to settle down. UHG did not exactly jump into the Exchanges, in fact their Exchange enrollment is a rather modest 540k members out of UHG’s 47.4 million total enrollment. That’s just over 1 percent. And, in some states, such as Illinois, things are looking pretty good. Early on, UHG was quite cautious about the Exchanges. In 2014 UHG only participated in the individual market in one state where it paid into the risk corridor program (so it’s operations were profitable). Results were solid in the small group market as well; UHG participated in several marketplaces and overall lost less than $1,000 through the risk corridor underpayments – while paying into the program in several states. My view: UHG is a national player that is not particularly well-positioned in many local markets and therefore has a tough time competing with the Blues. There are two key dimensions to this. First, the Blues have better brand awareness than UHG on a national basis, and individual plans likely have even stronger consumer recognition in many local markets. While UHG is a huge player nationally, health care, like politics, is local. And no one does local better than the Blues. Second, the Blues – provider relationship tends to be more collegial and less adversarial than the UHG – provider relationship. According to athenahealth’s PayerView, UHG’s commercial offerings rank 53rd out of all health plans reviewed, well behind many Blues plans. In fairness, UHG is strong in some markets, but overall Blues have better relationships with providers. The latter point is also pertinent to the Exchange issue. Payers’ success in the brave new world of health care will be driven by close cooperation between payers, providers, and members. Data sharing, management of potentially-expensive members’ health, and cooperation in marketing are all essential, and that’s where the Blues’ decades-long local relationships will pay off. Things can and often do get contentious, even when Blues are involved (see New Jersey…), and when they do the stronger and longer the underlying relationship, the more chance things will work out. There’s another dimension to this; some critics including colleague and mentor Bob Laszewski have noted the impact of adverse selection on UHG’s results. Simply put, too many less healthy folks have enrolled to date, and not enough healthy ones. This will change over time as penalties for non-participation increase; 2016’s is $695 per person. Yes, health insurance plans are too expensive. Yes, deductibles and member cost-sharing is too expensive for many. The inevitable result of the individual mandate combined with standardized benefit plans is narrow networks, lower health care prices, and aggressively managed member health. It’s going to be messy and painful. It’s also necessary to reform an industry that accounts for 18% of our GDP while delivering a product that is often low quality.